Recently brought to the sales market by Denison & Daves, the 79m motor yacht Pegasus V is also available for charter through Ken Denison. Having undergone a recent complete interior refit, Pegasus V is one world’s most prestigious superyachts of her size available for sale and charter. Complex and sophisticated use of marble, onyx and bold coloured soft furnishings flow seamlessly through her six decks. This beautifully styled and very spacious yacht is equipped with every conceivable amenity, featuring a helipad, a party deck with disco and cinema plus a beach club and pool. Lloyds classed and MCA compliant she accommodates 12 guests in a full beam owner’s suite with private terrace plus two VIPs, two doubles and a twin. 27 crew led by Captain Martyn Walker are on hand to cater for every need and she carries three tenders and six jet skis. 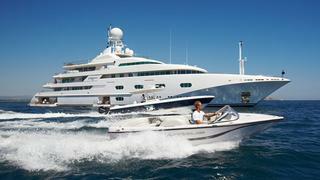 Weekly charter rates are €650,000 in the Mediterranean and $650,000 in the Caribbean.